I like the concept of that CM. Same. It's really nice to see this franchise embracing body diversity and different kinds of gender expression. Want a good wholesome laugh? I'm getting worried. I am not sure but back in the day Yukie Sako was announced soon before or even at the same time Crystal key visual was revealed. I might be completely wrong though. Then when they revealed the second designer the key visual was shown pretty quickly after that. Now nothing. I hope this not go in a development hell and cancelled in the end. I doubt funding is the problem as the franchise is doing pretty well. But who knows. But you are talking about a series that can handle production and promotion at the same time the series is shown on tv, for example 1 episode done (from 13), that's 7% of the total animation, with only 1 episode done they can start the marketing of the series. A movie has to be finished at least 80 or 90% before they start advertising it, they also need a release date. About the logo, they are not using it because they remember PGSM, they are using it because that's the anniversary logo. It is true, but movies usually get more promotion to hype people. Most movies have key visual, cast and even teaser a ling time before premier. Whit the situation as it is, they will pass next year as well. I just watched some clips of the Sailor Moon R movie and I got quite excited about Tadano-san taking over to do the character design (and maybe being animation director too???). I couldn't be more excited, to be honest. Do we know any recent work she's done? 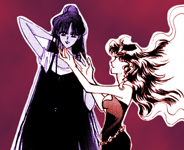 The picture below reminds me kow much i in general prefer 90s anime character design over recent tendencies. @JunoDX I love this! It looks gorgeous! This is so reminiscent of Naoko's work! I like the way that pic looks...all it needs is the Crystal touch with tiaras, skirts and what not. I would love to have the skirts back instead of the flat ones S3 had but other than that. One thing I noticed from the 90s anime that I don't seem to see in other forms or the new version (unless I'm overlooking) is the eyes. 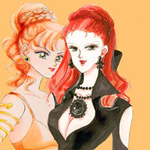 Each Senshi has a unique look to her eyes that I don't remember seeing in Crystal...I'll have to go back & look but I don't remember seeing that. I agree, oddly Tadano's work (dunno if there's any other animator but I'd say 90's in general) looks more closer to Naoko's than Crystal's did. I'll have to go back & look but I don't remember seeing that. I think I'll do the same. Kazuko Tadano definitely bought the manga art style to life.